When my mind is restless I like to feed it some inspiration. 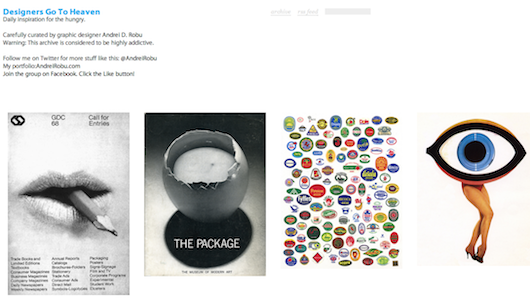 I like to visit sites and blogs to appease my hungry mind and boost my creativity. Below is my latest current of inspiration, each for distinctive reasons. Authored by Rosetta Thurman, Blogging for Branding! is a blog that offers great information, tutorials and challenges to learn how to blog your brand to build and grow your business and career. I'm inspired by the blog's focused, purposeful and relevant information. Curated by graphic designer Andrei D. Robu, this blog is a collection of hand-picked graphic design works of art for those of who need frequent shots of inspiration. Penned by John Boardley, this site aims to make the subject of typography more accessible to the masses. Typography is an art in itself. Just look at all the beautiful ads, posters, or even the Declaration of Independence. I didn't study typography formally so I'm no expert, but this guy is and gets you uber excited about fonts! I just love to look at logos. They are small works of art. With a handful or two of logo galleries, I chose this one as my current stream of inspiration, but I have quite a few. Started by Scott Schuman, this blog is impressive in that it uses the simplest layout available in blogger.com, doesn't host it's own domain, but receives 100's of comments daily, has been selected as one of Time Magazine's Top 100 Design Influencers. 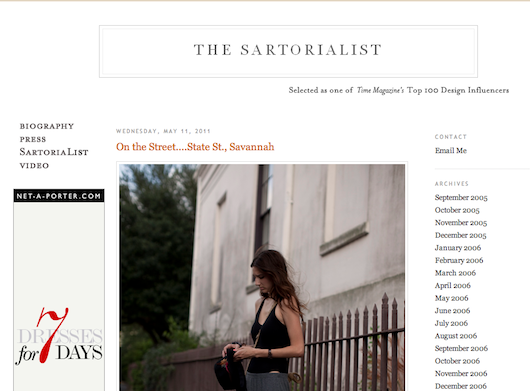 I admire this blog's growth, simplicity and impact. I appreciate the beautiful photography showing what "real" people are wearing. 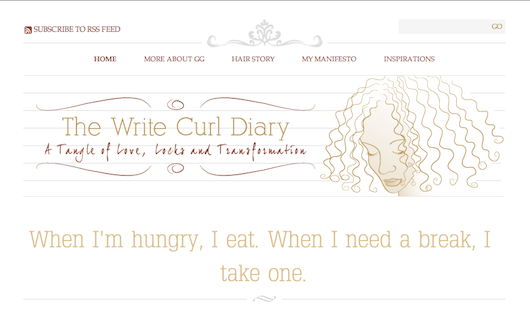 Penned by GG Hill, The Write Curl Diary advocates for the success and emotional well-being of the modern woman. GG shares her personal journey of transformation on her blog. What I admire most about this blog is the author. A 9-5 professional, a mother of three, a wife, and she consistently delivers these lengthy beautiful essays. When I get my WriteCurlDiary in my inbox, I am always in awe of what she's written and in her delivery. When I feel uneasy because I'm not writing as much as I'd like, I visit The Write Curl Diary to rekindle that flame.